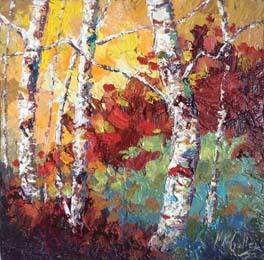 These aspens and birches look great hung alone to brighten up a little spot, or in a grouping with some of my other 12x12 trees. Hang them horizontally, vertically, on a diagonal or stacked. If interested in seeing companion pieces, please e-mail Niki Gulley for options.